The Chevrolet Blazer debuted in 1969 as GMC’s smallest full-sized sport utility vehicle option. Throughout its existence, the Blazer was based on a short wheelbase truck. Production of these vehicles ceased in the mid-90s when they were renamed as the Chevrolet Tahoe. Blazers have the highest rate of driver deaths according to the Insurance Institute for Highway Safety. If you or someone you love suffered injuries or worse in a Chevy Blazer rollover accident, contact the Chevrolet Blazer rollover lawyers of The Willis Law Firm at 800-883-9858. Like other sport utility vehicles, the Chevrolet Blazer has a high center of gravity, which makes it more prone to rollover accidents. Additionally, older models have removable roofs, which detract from the roof’s structural integrity. These serious injuries may leave the affected vehicle occupants with long term disabilities and ailments. In more severe cases, individuals may even pass away from their injuries. 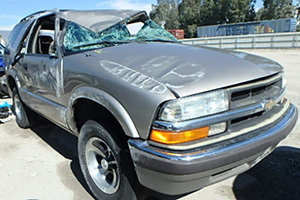 Individuals who have suffered injuries in a Chevy Blazer rollover accident should discuss their legal rights and options with a Chevrolet Blazer rollover lawyer. The Chevrolet Blazer rollover attorneys of The Willis Law Firm may be able to help you seek financial compensation if you have been injured in a rollover accident. For more information about your legal rights and options, contact us today at 800-883-9858.